Throughout The Wort Hotel, unique finishes and characteristics define our commitment to Western hospitality and our rich heritage. 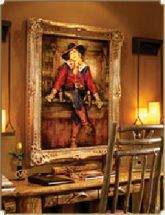 The finer touches can be found around every corner of this Jackson, WY hotel and include original artwork and custom western furniture throughout the lobbies and in guestrooms. Be sure to look for the thousands of uncirculated Morgan silver dollars inlaid on tables and The Silver Dollar bars. And of course, one of our finest touches is the friendly,dedicated staff who will greet you everyday. The Wort Hotel commitment to guest service is unparalleled. Our intimate Jackson Hole lodging accomodations and dedicated staff combine to form a truly personal relationship and are committed to the guest experience. All bathroom amenities are specially crafted for The Wort Hotel and allow our guests to enjoy the finest spa-quality bathroom amenities. All rooms are standard with hypo-allergenic down pillows and duvets. All bedspreads and pillow shams are locally hand-crafted specially for The Wort Hotel. Over 200 pieces of original or limited edition oils, bronzes, furnishings, sculptures and historical photos are on display in the hotel's public spaces. Learn more about The Wort's art collection in our walking tour. A universal symbol of friendship and welcome, the yellow rose extends the same sentiment to each visitor to The Wort Hotel and invites you to a stay among friends in Jackson, Wyoming. Leave your order on your door the night before and have breakfast delivered to you in the morning. Twice daily housekeeping. Arrive back to the Jackson Hole hotel after a day outside with the room set up for relaxation. With access to the top vendors in Jackson Hole, Wyoming, our concierge will call you two weeks prior to your stay to help you plan and arrange all activities. Get up to date ski conditions from the comfort of your Jackson Hole hotel room.